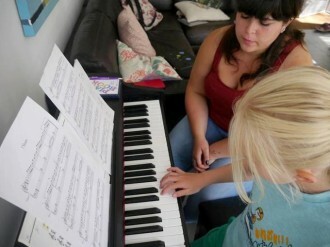 " Sasha has been giving piano lessons to our 6-year-old son and myself for over a year now. Her personalised approach to each student is a hallmark that makes her the best teacher for us. She was able to engage with the child using letters/numbers/sounds and encourage his efforts rather than results. She instilled in him valuable lessons of consistency, perseverance and optimism that surely he will use them in other aspects of his life in the future. I am amazed how much music theory knowledge can 6-year-old retain and understand with Sasha’s approach. Similarly, with myself going back to practising piano after many years, she was instrumental in bringing up my confidence level and nurturing ‘can do’ attitude by encouraging gently ‘chipping away’ to hard pieces. My whole life I had a dream to learn the ‘Moonlight Sonata’ by Beethoven and she helped me achieve my goal literally within months and move on to new dreams that I could not have imagine were possible before I met Sasha. We both look forward to continuing our lessons with Sasha in the future and highly recommend her to any child or adult who wants to learn to play piano but hesitates feeling overwhelmed - Sasha breaks it down and makes it an easy and fun process. " " Sasha is a truly inspirational and unique singing teacher, who has built up a fantastic rapport with our 10 year old daughter, who cannot wait until Friday for her singing lesson, which is the highlight of her week! Thank you so much Sasha! " 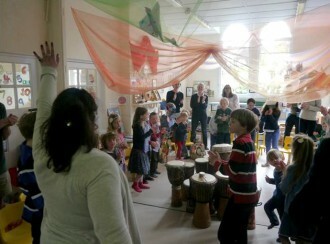 " Sasha is an extraordinarily gifted teacher with huge amounts of energy, enthusiasm and positivity. We have 4 children between 5 and going on 10, all with a markedly different mentality. Sasha is superb at working out the best approach to learning for each child. The result is a great passion to learn the piano. They all want to practice and improve without us parents having to remind them. Perfect!!! "